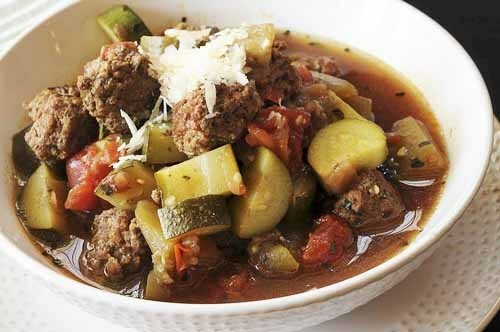 Meatball Ratatouille Soup is packed with mini meatballs combined with eggplant, zucchini, tomatoes and Italian spices in this delicious soup–easy on the waistline. Answer? All except e. And “e” could be true, but I ‘m unable to verify the facts. 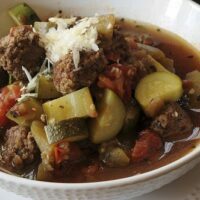 You may know “Ratatouille” as a movie or a cold soup. For me, it’s best as a hot soup for a “fat” day. Can you relate to “fat” days? If you are a woman, I’m betting you can–no matter what you weigh. Feel free to leave out the meatballs if you are vegetarian or vigilantly counting calories. However, they add flavor and texture. Mushrooms would be a nice substitution, if you favor that route. Form ground beef into mini meatballs. You can do this by hand but my preference is a tiny ice cream dipper. Brown in large saucepan or dutch oven. Add onions and green peppers to ground beef and saute 2-3 minutes. Add garlic and saute another minute. Add zucchini, eggplant, tomatoes, broth and seasonings. Simmer 15 to 20 minutes. Serve with fresh grated parmesan cheese if desired. What a great dinner for the winter. This Meatball Ratatouille soup looks so good. I will be trying it soon and I know my family will enjoy it as well. Thanks for sharing all your great recipes. You rock! This soup sound delicious – and nutritionally is very good too. i’ve always enjoyed this soup when you make it! i like the quiz at the beginning of your post….definitely got me to actually read the text. Ironic that you post this today. We just watched the movie last night!! !